I can’t really be upset about the outcome of last night’s game because it was basically Futures at Fenway Part 2, but without fair competition. All of our starters, with the exception of Big Papi and Gonzalez, got the night off, but Toronto put in its best. We sent the entire reserve out there to face who but Roy Halladay, and we got shelled. Show me someone who’s surprised by this outcome, and I’ll show you someone who has no conception of the disparity between skill levels present in Major League Baseball. Unless something had gone horribly wrong for Roy Halladay, there’s no way a reserve would have bested him. This game was absolutely necessary. It was a stroke of genius, and it spoke to our commitment to winning the World Series. What’s the best way to ensure that your reserve is the best it can be? Give it playing time. And what’s the best way to do that? Hand it an entire game against one of the best active pitchers in the game. They may not have done well, but at least they “did.” At least they played. Halladay pitched a complete game three-hitter. Gathright hit two of those three, and Baldelli hit the third with a steal. Wakefield gave up five runs on seven hits with two walks and two strikeouts over three innings pitched. Three of those five runs were attained via the long ball. So something’s still not right with him, which is probably why he started. In all likelihood, his health will keep him off the playoff roster, which means the season will be over for him soon enough and he’ll have all that time to recuperate fully. So that’s why he started last night. Fernando Cabrera gave up three runs on three hits and two walks in an inning and pitched to three batters in the next without recording an out. Dustin Richardson was able to extricate himself from that jam in just eighteen pitches. Delcarmen’s struggles continued as he gave up two runs on three hits in an inning, allowing Randy Ruiz to hit his second home run of the night. Hunter Jones did okay. Hideki Okajima gave up a solo shot. And Dusty Brown, catcher, gave up a run on two hits in the ninth inning, with a strikeout to his credit. So while watching this game, all I had to do was remind myself that bench players and minor leaguers were going up against Roy Halladay, and then I’d sit back, relax, and take it in for what it was: a chance to get a glimpse of what we might be seeing this October from the bench and what we might be seeing from our farm system in the future. Although with Halladay on the mound, the view was somewhat skewed. Case in point: the final score. Unhealthy starter plus unseasoned and struggling relievers plus unseasoned hitters equals a final score of 12-0. I am proud to say that we didn’t make a single fielding error, which is impressive given all of Fenway’s quirks. If you’re wondering why Tito wasn’t present at the Wild Card celebration, it was because he flew to Virginia for his son Nick’s graduation. That completes a three-game sweep for Toronto, and now we square off against Cleveland for a four-game set. This is the final audition for our four playoff starters. Lester will pitch tonight for the first time since taking Melky Cabrera’s line drive just above the knee, and Beckett will start Saturday after having received a cortisone injection in his back to help with the spasms. Cleveland isn’t too intimidating, so it’s perfect for getting back in the groove. Then the regular season ends, schedules are finalized, and the playoffs begin! In other news, it’s the first day of hockey season today! We open at home against the Washington Capitals at 7:00PM! And dominate we most certainly did not. Again, Red Sox fans work from nine to five to come home and watch the Red Sox lose, 9-5. But the loss isn’t important. The nine runs we gave up and the five runs we scored aren’t important. Jon Lester is what’s really important. Lester pitched two and a third innings of very shoddy ball. One of his worst outings all season. Five runs on eight hits with three walks, three strikeouts, and a two-run shot by A-Rod. He was inefficient, he was nervous, and he was ineffective. At one point, John Farrell and Jason Varitek came out to the mound to talk to him, but what do you say to a guy in that situation? It’s not like he’s pitching like that on purpose. The postseason’s around the corner, and he’s feeling pressure, like this is his big audition to prove that he can handle being our Number 1 starter. Obviously, no pitcher of his experience should feel that way at this stage, especially not since he was our Number 1 starter last year. But it wasn’t just that. The Yankees were figuring him out. Suddenly, he was an easy pitcher to hit. That’s never been the case. It was easy to see, though, that his timing was off, as evidenced by the fact that the Yankees were running all over the place. A-Rod stole three bases. Even Robinson Cano was running, and when Cano is running, you know something’s up. Never mind the fact that everyone tries to run on Tek; this was just ridiculous. Lefties are notoriously slow in their delivery, but still. Seven stolen bases in a single game. But that’s not important. Lester’s seventy-eighth pitch was a line drive by Melky Cabrera that came straight back to him. It hit him on the side of the knee, just above the bone, inches away from his kneecap. Lester went down, and he stayed down, and you could literally see his pain. Red Sox Nation held its breath as one as the fate of the World Series rested on the knee of Jon Lester. He finally made his exit, walking off the field on his own, and was taken for x-rays immediately. The x-rays were negative. It’s just a contusion. He’s listed as day-to-day put plans to make his next start on Thursday. Red Sox Nation sighed in relief as one as the dream was kept alive. And that’s what was important. Right now, the division would be absolutely fantastic, but it would be more valuable to us in the long run if the starters rested and the bullpen got its work in so that we’re raring to go when the playoffs start. And if Jon Lester were injured, the entire timbre of the playoffs would have changed. Our expectations of how deep we would go would have changed. All you need is your ace writhing on the ground in agony to make you realize just how valuable he is to your club. But thankfully, and when I say thankfully I mean thankfully, he’s okay. So the bullpen was in for a long night. Hunter Jones, Michael Bowden, Delcarmen, and Ramirez each had shifts. Between them, they pitched 5.2 innings, gave up four runs on six hits, walked six, and struck out five. Not the greatest. Not at all the greatest. Heading into the fourth inning, all we wanted was at least a hit off Joba Chamberlain to get us started. It came in the fourth in spectacular fashion; a home run by Victor Martinez with two out in the inning. That was quite a hit. He finished the night two for four. Youk also went two for four with an RBI. Drew went two for three with a double. 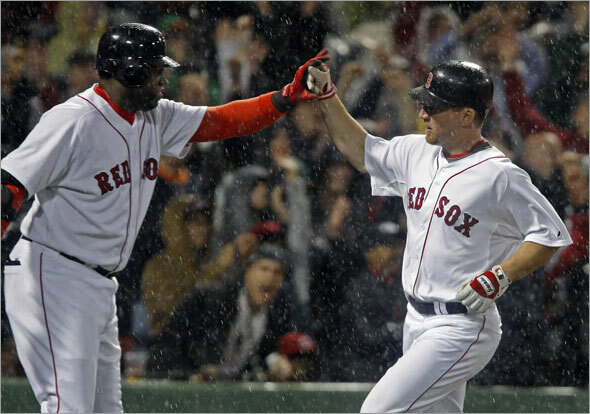 And Big Papi hit quite the two-run shot with two out in the sixth; he would finish the night with three RBIs. Pedroia stole. Tek went 0 for 4 and struck out twice. He’s currently batting .208 and only .124 since August 1. He has a neck injury that’s been bothering him since June. He just had a bad night, period. Guess who finally convinced Billy Wagner to come to Boston? His wife, Sarah. Smart woman. Very unlike one Leigh Teixeira. So much for Girardi’s theory. See, this is why you don’t broadcast to the entirety of Major League Baseball that you’ve only restored your dominance if you can beat that one team. Because then if you don’t beat that team, what are you exactly? A doormat for everyone else to step on. Not that I can disagree. The Yankees’ tried and untrue dominance is over, and to think that Girardi actually had the idea in his head that he could take at least two of three from us in this series is laughable. I mean that organization just lost so much credibility, and compared to the amount of credibility they started with, well, let’s just say they don’t have much left. Girardi claimed that the Yankees are back and that, to prove it, they’d win this series. Instead, they’re going home to face the Mets with their tails between their legs because we swept them right out of Boston with our eighth straight victory against them. I have to say, it feels good. And the two-game cushion of first place is pretty comfortable, too. Brad Penny got a no decision, courtesy of Manny Delcarmen, even though he pitched magnificently. Six shutout innings, only six hits, a walk, five K’s. That was it. A season-high 117 pitches but he was on, and his velocity remained even as he went deep into the ballgame. His fastball touched 95 miles per hour repeatedly, and he even hit 96 a few times as well. It was awesome. Combine that with the fact that the score at the time of his relief was 1-0, due exclusively to David Ortiz, and it felt just like old times. In the second inning, Big Papi looked like his old self again and launched a solo home run into the Monster seats. And not the first row, either. That ball landed a few rows back. There’s just something about the Yankees that gets a Yankee killer going. 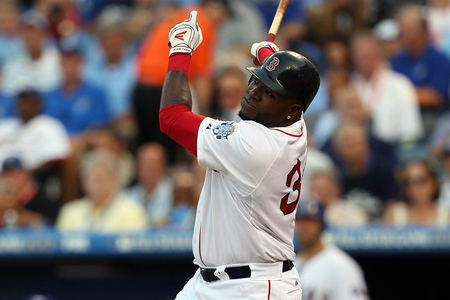 So Ortiz hit his fourth of the year in all the glory of a night game against the Yanks at Fenway Park. Then along comes Manny Delcarmen in the seventh who, in less than an inning, gave up three runs and the lead. Which never happens. I was watching that and I couldn’t believe what I was seeing. Manny Delcarmen? Three runs? In the seventh inning? To give up the lead? Impossible. Apparently not. Luckily, we’re us, and we scored three runs to answer in our half of the eighth. Girardi left Sabathia in to pitch to Green, who got on base, and Drew, who batted him in. Eventually he took him out, but then Bay and Lowell collected RBIs of their own and we won, 4-3. It was a good example of manufacturing runs. Very nicely done. Just goes to show you that you can never count us out. Ever. No matter how late in the ballgame or how many runs we need to score. Not a good idea to count us out. Because we come back very quickly. So Delcarmen got a blown save, Saito got the win, and Paps picked up his sixteenth save of the year. Drew finished his night two for four. Pedroia went hitless but worked a ten-pitch walk, which is what I like to call being a dirt dog, making the pitcher work, and having an MVP at-bat. Baldelli had himself an absolutely fantastic catch in the eighth inning, and that’s something we don’t get to see too often because he can’t play everyday. Cabrera hit to center, but Baldelli tracked it, dove, slid, and made the catch. Fantastic. Green began the ninth just as strongly as he began the eighth: Jeter hit a ball that looked like it was headed past him to center field, but Green ran it down, grabbed it, spun, threw to first with pinpoint accuracy, and recorded the first out of the inning. And Ortiz was perfect at the plate. Much like our current record against New York. So that’s that with the Yankees for a while, but hey, they can come back anytime they want. We’ll be ready. That was great. Big Papi showed more signs of life in this series than at any other point this season, so I say bring it. Tonight we have work to do in Philly against Joe Blanton. We’re throwing Lester tonight, and if his outing even remotely resembles his last one, we’ll win this hands down, no questions asked. I mean Lester almost tossed a perfect game his last time out, so basically the worst we’re looking at is, what, a no-hitter? That would really be something. We’ll see how this goes. I love Interleague.